My cat is now officially spoiled rotten. 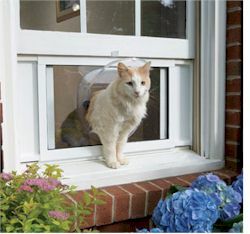 This PetSafe Cat Windoor doubles both as a point of entry and a veranda. Not only can she lounge, relax and enjoy the sunhine she can stroll outside inside our fenced yard whenever she chooses. It gives her freedom of movement and her own personal space that’s just for her. At this price I couldn’t have asked for anything better. Ultra-affordable and easy to install this is one of the best values I’ve found in pet products. With enormous savings over the local pet super-store I saved money and even got better service. Thanks for another great product!